The user search currently is not guaranteed to respect ACLs or domain separation. When using the Live Feed in the browser, a user can type “@” and then start typing a user’s first or last name. If the system finds some users, it displays them below the message box, and the user can click on one of the names to “tag” that user. Many users can be tagged in a single message. When a user is tagged, their user name will replace their name during message composition. Once submitted, the user’s name will once again replace the user name. Note: This switch, while confusing, is done to enforce unique tagging. If a user is tagged in a message, they will receive a notification with the message text and a link. In the left hand navigation menu, there’s a hidden module called “Social Injection”. This item pulls in it’s own JQuery instance, and then uses that to monitor the primary frame and make the necessary modifications to the Live Feed. When the @ symbol occurs, AJAX queries are sent for every keypress, to look for users, until the query returns nothing – then it waits for a backspace event or another “@” symbol to start looking again. When a message is submitted, a before business rule handles swapping the user names back to the names and firing off an event, which triggers a notification. Import, Preview, and Commit the update set “2014-02-11 – Social Feed Enhancements v0.1- GG”. This functionality currently only works on the standard ITIL view with the left hand navigation showing. Would like to improve this to make it work from all views. Currently only works in the top message box. Would like to make this work in every reply box on the page. Test and certify in all Service-Now browsers. Test and certify on Berlin + Calgary. Contains the code to fire events/notifications after a user is tagged in a message. Contains the client side code to enable the tagging functionality. Contains the server-side AJAX code to perform a user search and return the results to the browser. Fired once for every user tagged in a message. Triggers the notification. 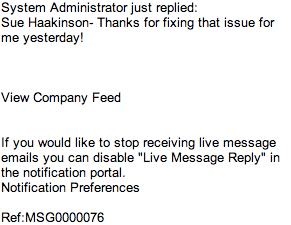 Sends out an email notification alerting a user that they’ve been tagged in a Live Feed message.